This deck of 48 Knowledge Cards offers a concise illustrated history of the civil rights movement and a chance to make the acquaintance of many brave, brilliant people. Each card has a photo of an important event or person on one side and a brief biography or account on the other. 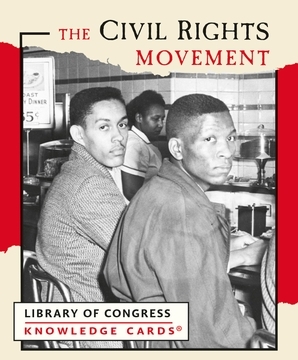 From legally sanctioned segregation—which wasn't limited to the Deep South—to Freedom Riders rolling into the country of white rage; from Brown v. Board of Education to Rosa Parks; from Dr. King's Southern Christian Leadership Conference to the Student Nonviolent Coordinating Committee, these cards tell the story of a turbulent era and a proud achievement.